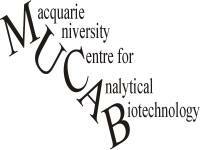 MUCAB provides a unique and active focus for interdisciplinary research between the Departments of Chemistry and Biological Sciences at Macquarie University. The Centre manages substantial instrumentation resources appropriate for the contemporary study of biomolecules and natural products, and has lead to Macquarie University being recognised nationally as a centre of excellence for biomolecular analysis. MUCAB users include academic staff, honours students, postgraduate students, and Research Fellows. MUCAB is not a service facility, but does provide training in the use of intrumentation. MUCAB is supported through financial contributions from users for the calendar year and support from the Department of Molecular Sciences and the Department of Biological Sciences. Instrument usage is logged via an on-line booking system. Potential users from outside the university are welcome to make enquiries to the directors. To find out how to utilize the resources of MUCAB for your research, and to assist you in forming scientific collaborations involving MUCAB, please contact the Directors. 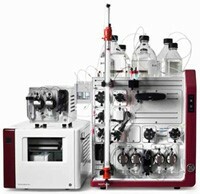 A system for small- to medium-scale separation and analysis of proteins and peptides. Gel filtration, ion-exchange and reverse-phase chromatography are supported by the system and a chromatography wizard assists in method development. An advanced fraction collector is available allowing the collection of fractions into microtitre plates and a range of tube sizes. Light scattering (LS) and refractive index (RI) detectors are also available to determine the native MW of proteins. 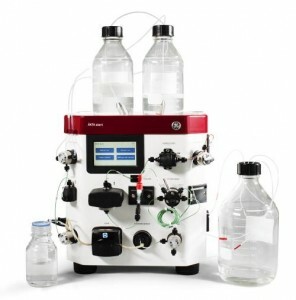 A low-pressure chromatography system ideal for the purification and analysis of biomolecules. This system provides high performance, versatility and ease of use for low-pressure applications. Gel filtration, ion-exchange and reverse-phase chromatography are supported. An advanced fraction collector allows collection into a range of tube sizes. Desalting/buffer exchange, affinity, gel filtration, and ion exchange are supported. 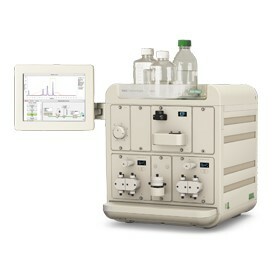 NGC chromatography system is also useful for development and optimising purification protocols. 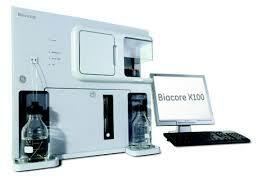 Biacore X100 biosensorProtein-protein and protein-ligand interactions can be studied using surface plasmon resonance. A protein or a ligand is bound to the surface of a sensor chip (purchased by the user from Biacore) using one of several standard chemical methods, e.g. a biotinylated ligand may be bound to a streptavidin chip. 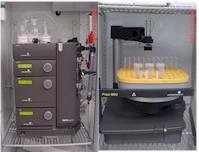 Buffer containing the analyte is then allowed to flow over the surface of the chip, with binding and release monitored in real time.See the Biacore website: http://www.biacore.com for more information. Jasco J-810 Spectropolarimeter linked to a BioLogic Stopped-Flow ApparatusCircular dichroism (CD) probes the structure of molecules (including small organic molecules, proteins and nucleic acids) through an analysis of chirality (or handedness). For proteins it is particularly useful for monitoring changes in structure upon ligand binding or changes to the protein’s environment. A range of cuvettes is available for a variety of specific applications. Organic and aqueous buffers for use in MUCAB can be filtered/degassed. A set of Eppendorf pipettes and tips is available for users.